Thanks to The Game Awards and Sony's PlayStation Experience conference, this weekend was full of new game reveals and new trailers—none of them for Fallout 4. Even through that resigned disappointment, we decided we'd better snag a bunch of trailers and throw them into an article for you. Read on for Grim Fandango, Day of the Tentacle, King's Quest, and other games that didn't originally come out in the 90s. The big news as far as the Grim Fandango remaster is concerned: A release date. January 27, to be exact. I've gotten to play the intro on this one, and it's looking beautiful for a game originally released fifteen years ago. Tim Schafer also revealed there's a second remaster project in progress at Double Fine right now. 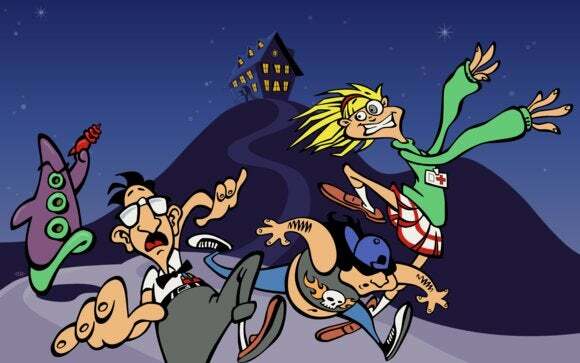 Following on from Grim Fandango, the studio will also be putting out a remastered version of Day of the Tentacle. There's no release date or trailer for this one yet, so you'll have to take my word for it. And because 90s adventure games are all the rage right now, "Sierra" showed off its new King's Quest game at The Game Awards on Friday night (following a pretty stunning tribute to Sierra founders Ken and Roberta Williams). It's made by The Odd Gentlemen, who developed the stellar Misadventures of P.B. Winterbottom and the less-than-stellar Wayward Manor. I'm pretty sure I heard my editor Brad Chacos squeal with delight when this was "announced," and I live 3,000 miles from him. (Confirmed --Ed.) Sure, we already knew The Banner Saga 2 was coming after that cliffhanger of an ending, but it's still nice to have the confirmation. Fullbright, the team that made love-it-or-hate-it Gone Home, has a new game on the way. We got a short teaser during The Game Awards. All I know is it looks like Gone Home in space so...I'm sold. The team that made Brothers: A Tale of Two Sons is also back, this time working with EA. We got less a "trailer" and more a "weird documentary thing," the same as EA's showing at E3 2014. In other words, lots of random shots of wireframe character models, et cetera. The new studio is called Hazelight, but as far as I know we don't know a title for the game yet. Stay tuned until the end of the trailer and you'll get a brief tease of the game itself, which features two guys hanging out on a train. Really, that's it. This one leaked a bit early, which kind of killed the surprise. Regardless, Capcom is making Street Fighter V and it's coming to PC. It'll also feature cross-platform multiplayer between the PC and PlayStation 4. We didn't get a real look at Metal Gear Solid V, but we did get a glimpse of its multiplayer capabilities (dubbed Metal Gear Online). Revolver Ocelot's looking less blocky nowadays. Another short teaser in a night full of too-short teasers, Adam Orth and Co. showed off their self-proclaimed "FPX" (for first-person experience) Adrift. It looks like Gravity, minus Sandra Bullock. This one's due out next summer, with Oculus Rift support included. And finally, the most-hyped of hyped games. This space-faring game hung out at both The Game Awards and Sony's PlayStation Experience, but the latter featured quite a bit more of the actual game so we'll post that one. No Man's Sky still looks fantastic, and I still have no clue what I'm supposed to do in the game.